Do you have a physical business that relies on customers walking in your door? Do you need more local customers? 70% of people online are shopping for local products & services (Comscore). Let’s face it… As each year passes, the internet continues to become more and more influential in our lives. We don’t sit in front of the TV to see what the weather is going to be like tomorrow. And we don’t buy newspapers to see what is happening in the world. When we want to know what’s going on, we grab a tablet or pull out our smartphone and within seconds we have the information we are looking for. Same goes when we want to know the hours of a local store, or the directions to a store, or if a product or service that we need is available nearby. We head for the internet. And within seconds, we have our answer. A recent Google study revealed that people who search with local intent are more likely to visit the store and make a purchase within a day. After conducting a local search, 50 percent of mobile users and 34 percent of consumers on tablets or computers will visit a store. The Google study also revealed that people who conduct local searches are more active buyers as compared to non-local searchers, once they are in your store. 18% of local searches lead to sales, as compared to 7% for non-local searches… So the question is, are you getting your share of business from people who are actively searching for the products and services that you offer? Or are your competitors gobbling up your share. Our expert knowledge can help you to start reaping the benefits of optimising for local searches. Local search marketing also referred to as local search and Local SEO is governed by different ranking factors and isn’t simply about having a Google+ My Business page. We understand the importance of listing your website in the right local sites, maintaining the quality of these listings and encouraging ratings and reviews to build the authority of your business online. 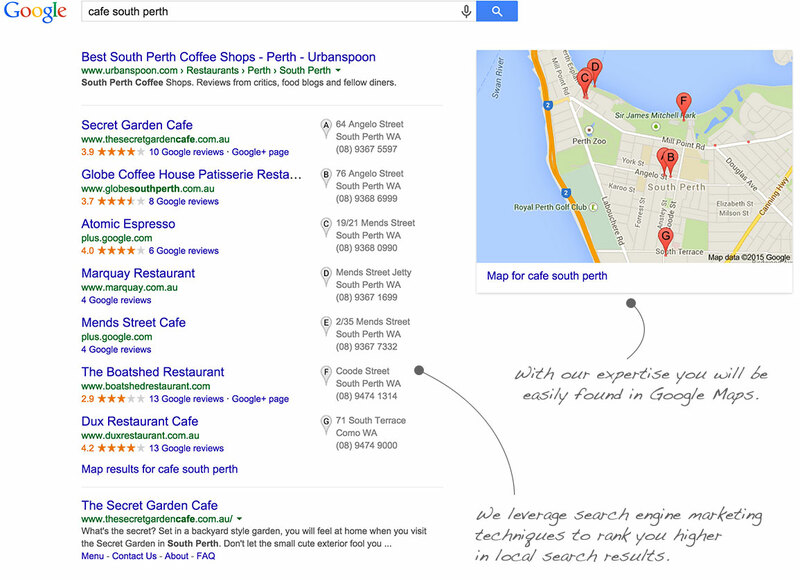 Done right and you will see the direct impact local search has on your business. Done wrong and you will find your business listed on many poor sites with incorrect information which can potentially jeopardise your chances of being found and reduce enquiries and sales as Google takes into account all factors when analysing your site compared to your competitors. Our services are individually tailored to your business goals and needs. If you are not sure if you are getting the most out of your Local Search Marketing do not hesitate! Request a Local Search Marketing review with me right now and I will get you on the right path whether you’re a business or brand.